2/17/11 -- HARPSWELL, Maine. Michael Bernier of Harpswell takes a short break from digging clams in Quahog Bay on Thursday afternoon. 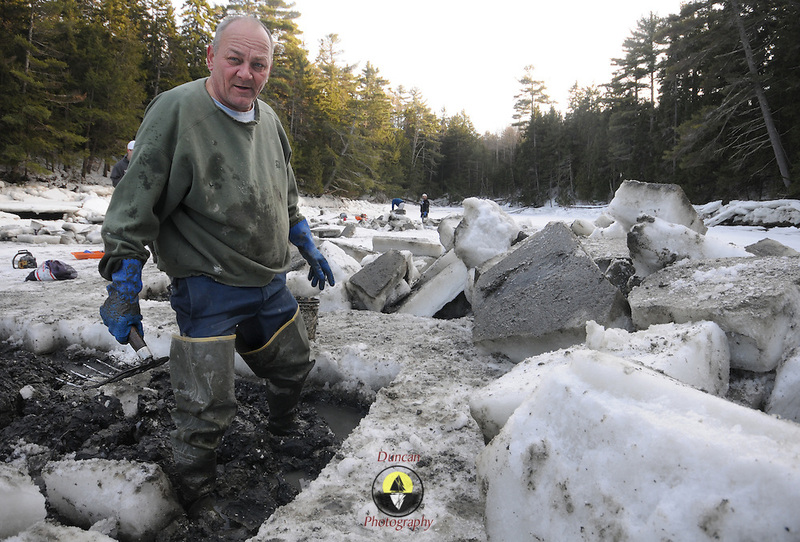 He and a small group of diggers cut through the ice at low water with chain saws to dig here. Quahog Bay was reopened for digging on Feb 11, 2011 after many years of closure, according to Department of Marine Resources Biotoxin Monitoring Manager, Darcie Couture. She wrote, "This area had been closed for many years due to failing water quality, caused by bacterial pollution. A serious pollution source was recently identified and remediated. The area will close in June for the summer, because unfortunately, this area, like many others on the Maine coast, suffer from the increased pressure of a seasonal summer population, which negatively impacts water quality, and results in many of our shellfish resources remaining closed to harvest during that time." Photo by Roger S. Duncan.